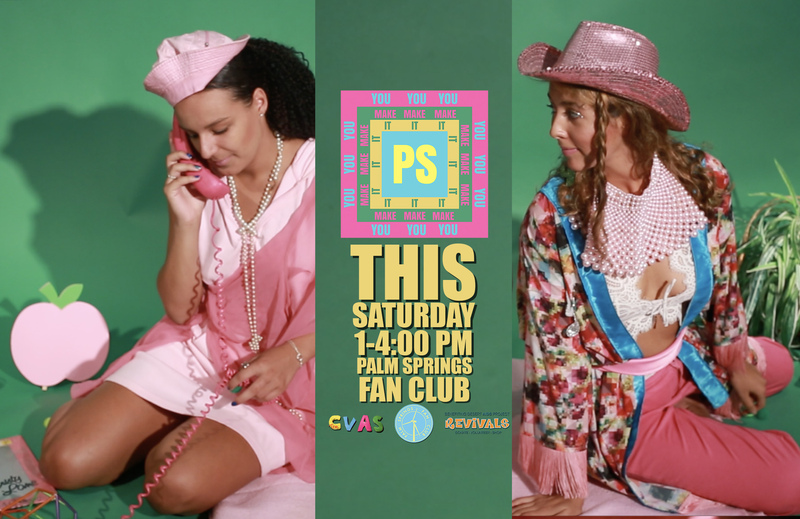 PALM SPRINGS, CA (August 14, 2017) – Revivals Stores and Sarah Scheideman — founder and executive director of The Coachella Valley Art Scene have partnered with Fashion Stylist Patrick Michael Lopaze to create a new POP-UP Event at Palm Springs Fan Club on Saturday, August 19. Palm Springs Fan Club is located next to ARRIVE Hotel in Palm Springs, CA. Guests of the event will be able to purchase t-shirts, accessories, or denim and customize them at the Coachella Valley Art Scene’s DIY table to apply their personal style. Proceeds will benefit Desert AIDS Project’s PAWS (Pets Are Wonderful Support Program). The event will also feature an artist talk with Muralist and Illustrator, Sofia Enriquez. The Indio native will present her capsule collection of hand-painted garments from Revivals Stores. Rafael Lopez aka DJ Alf Alpha will be spinning samples of vintage vinyl he’s collected at Revivals Stores combined with his own mix of new sounds during the event. The 21+ POP-UP event located at Palm Springs Fan Club is free and open to the public Saturday, August 19 from 1-4 PM. Palm Springs Fan Club is a cocktail lounge and event space located next to ARRIVE Hotel in Palm Springs at 1551 N Palm Canyon Drive. Designed with a nod to the iconic wind farms just outside Palm Springs city limits, Palm Springs Fan Club is a playful and unique location for pop-ups, receptions, meetings, and weddings. Revivals has three locations – Palm Springs, Cathedral City, and Palm Desert. The stores are largely staffed by volunteers who support our mission, which enables Revivals to make a significant financial contribution to the Desert AIDS Project. Revivals Stores have become a destination for bargain hunters, designers, and style influencers looking for unique items and creative inspiration. Each store features the Mode at Revivals collection of new furniture, lighting, rugs, wall art and décor along with resale thrift, enabling shoppers to create their own personal space inspired by the stores Mixed-Century Modern vibe. Revivals Stores won Best Furniture Store and Best Consignment / Resale Store in Desert Outlook Magazine’s 2017 Ultimate Pride Contest, Best Consignment / Resale Store in Desert Magazine’s 2017 Best of the Valley Contest and Best Consignment / Resale and Best Vintage Clothing Store in Palm Springs Life’s 2017 Best of the Best Contest.